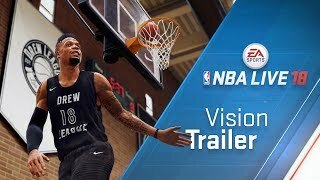 NBA LIVE 18 introduces THE ONE, a new dynamic career experience centered on your player, your choices and your legacy. Create your unique player identity and decide how you become a legend by mastering your selected role on the court along with signature abilities and traits. Embark on your quest to be the greatest basketball player on the planet in The League and The Streets with, or against other players in solo, co-op and multiplayer challenges delivered through LIVE Event content.